http://harlemtalkradio.com http://entertianmentharlem.com Singer Songwriter Paulette McWilliams performs TELLING STORIES at the Aaron Davis Hall Theatre, NYC. 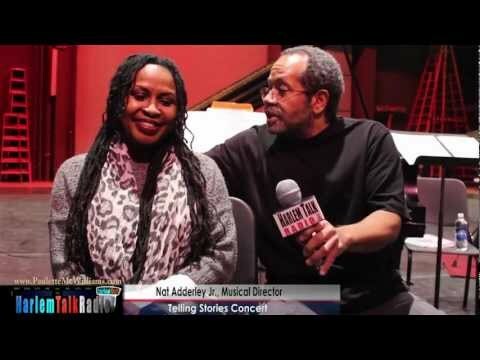 Nizer Saunders for HarlemTalkRadio.com interviews Paulette McWilliams, singer & songwriter on "Telling Stories." Paulette shared her rich and exciting journey in music from working with the one and only Luther Vandross, Michael Jackson, Mary J. Blige and Quincy Jones. Log onto HarlemTalkRadio.com and get connected. Singer Songwriter Paulette McWilliams performs TELLING STORIES at the Aaron Davis Hall Theatre, NYC. Nizer Saunders for HarlemTalkRadio.com interviews Paulette McWilliams, singer & songwriter on "Telling Stories." Paulette shared her rich and exciting journey in music from working with the one and only Luther Vandross, Michael Jackson, Mary J. Blige and Quincy Jones.